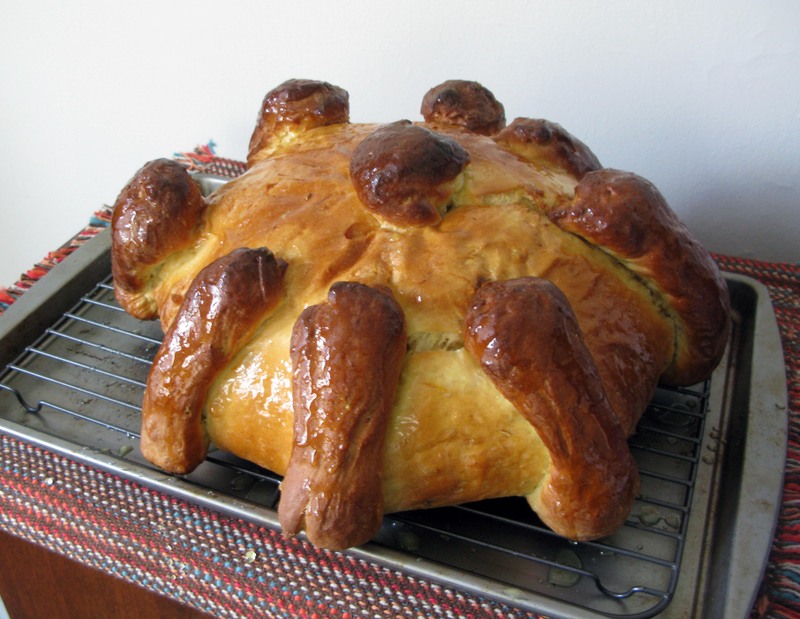 Pan de Muerto | I Wanna Bake! 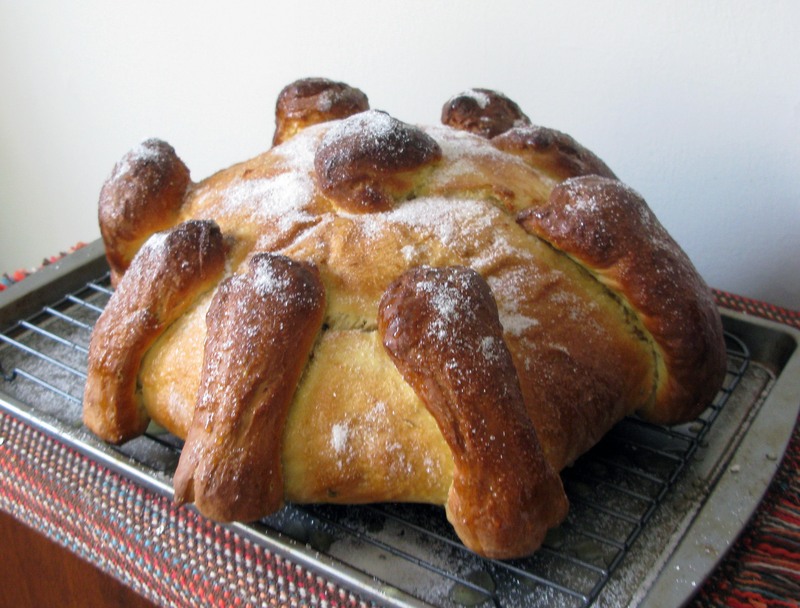 Pan de muerto is a sweet bread that is traditionally eaten during the celebration. 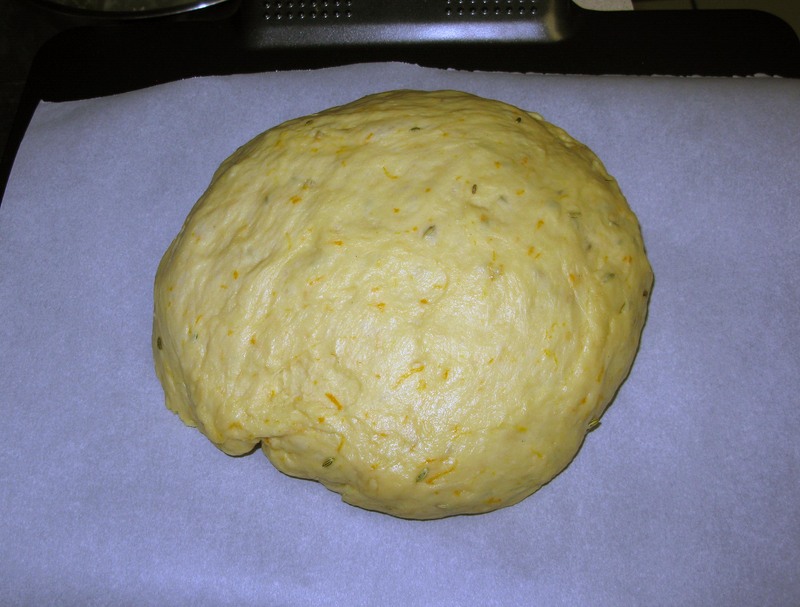 I used this recipe from The Spruce, which incorporates orange zest and anise (or fennel) seeds. I basically followed the recipe almost exactly, so I’m not going to include my own PDF recipe here. The only change I made was to use vanilla sugar instead of plain granulated sugar in the dough and on top of the bread. The bread has a lovely flavor on its own, so it’s really an unnecessary step, but I liked the hint of vanilla that the vanilla sugar added. I’ve never seen it anywhere for sale, but it is quite easy to make (though it does take time). All you have to do is put some used vanilla beans in an airtight container with some granulated sugar and let it sit. Shake it from time to time and break up any clumps before use. Easy. I did make a bit of a blunder in shaping the bread’s decorations, as it’s something I’ve never done before. 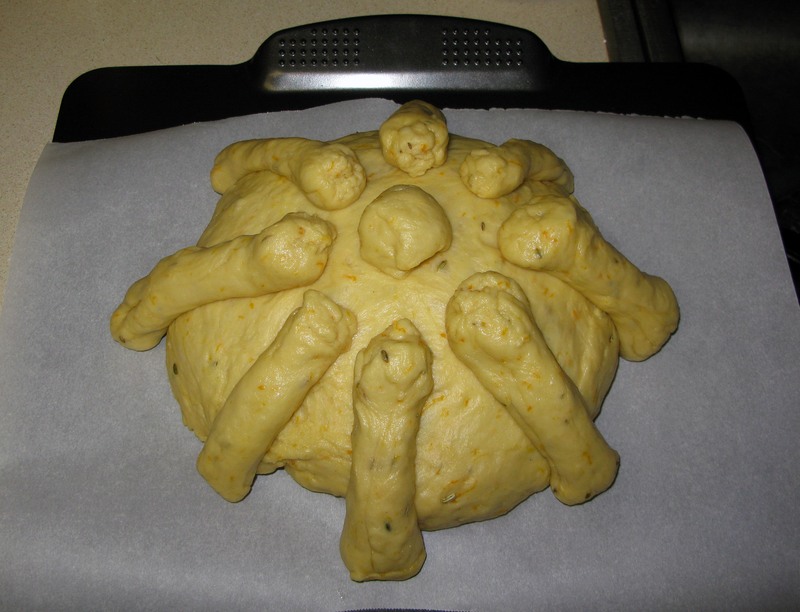 At first, I formed 4 pieces of dough into bone shapes and put them on top of the round loaf. The dough bones looked too fat, so I split them in half and made 8 dough bones instead (there are pictures of this later, so you don’t have to mentally visualize it). 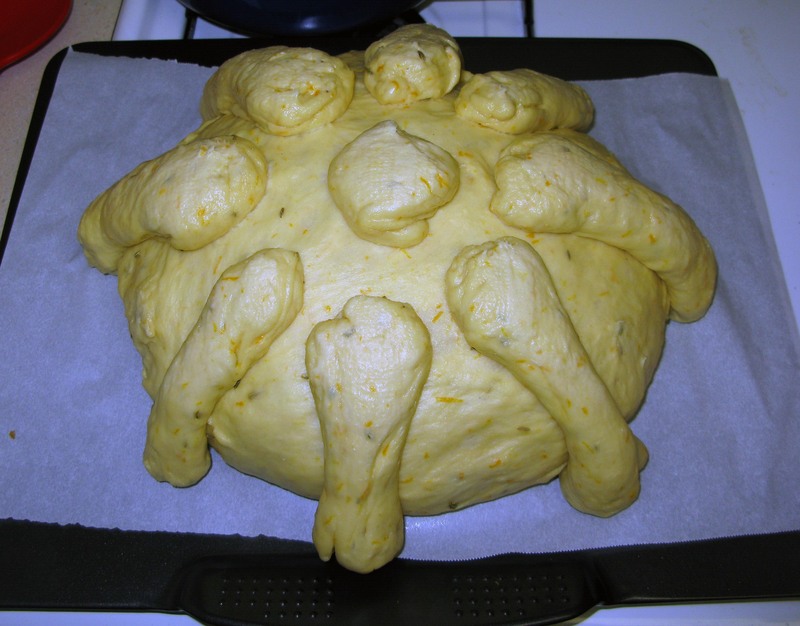 They looked alright, if not quite right, before the bread rose, but after rising, it was apparent that this loaf was not going to look quite how it was supposed to. When I went back to reference images, I realized that most people make bone pieces long enough to drape across the whole loaf and cross them at the top (oops). I’ll definitely try that next time in the hopes of achieving a more authentic presentation. One other thing I would like to note is that the recipe as written makes a LARGE loaf. My leftovers are currently split between three gallon storage bags. 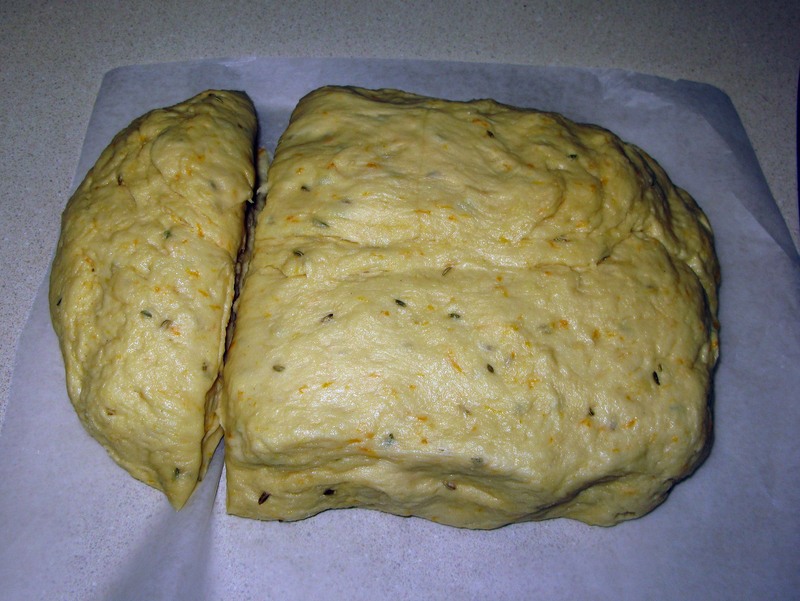 You can easily halve the recipe if you don’t want that much bread, or you can split the dough into two or four to make smaller loaves. Smaller loaves are likely to bake faster, so make sure to account for that and keep an eye on your bread while it’s baking. 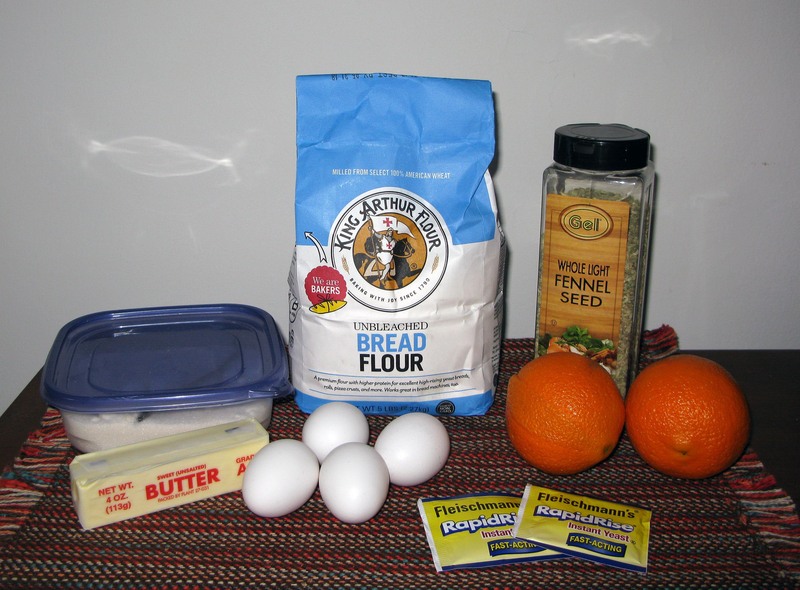 In a large bowl, mix together the butter, sugar, fennel seeds, salt, and ½ cup of the flour. I started doing this with a wooden spoon, then switched to a hand mixer, then just used my bare hands, so use whatever works for you. This part is a lot more like making cookie dough than bread dough, in my experience so far. 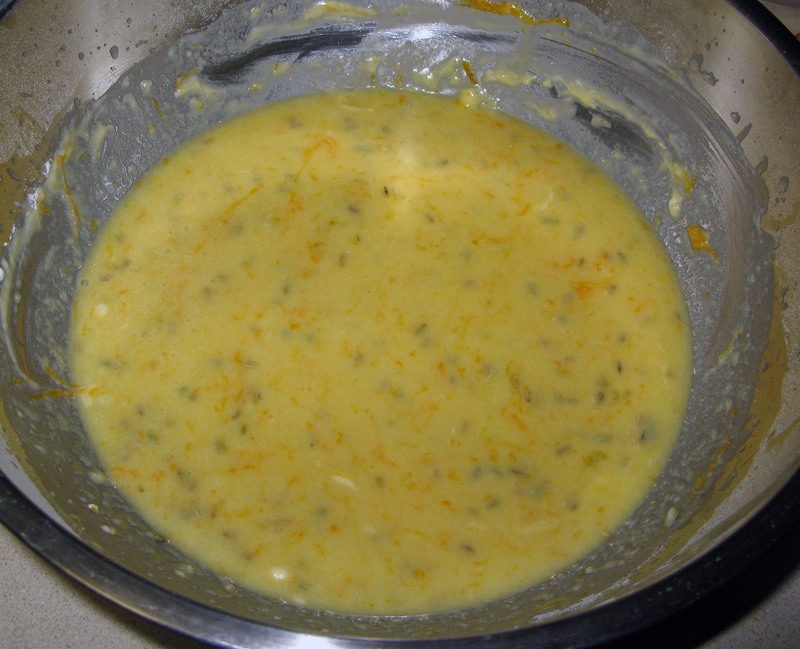 In a separate bowl, gently beat together the eggs, water, and orange zest. 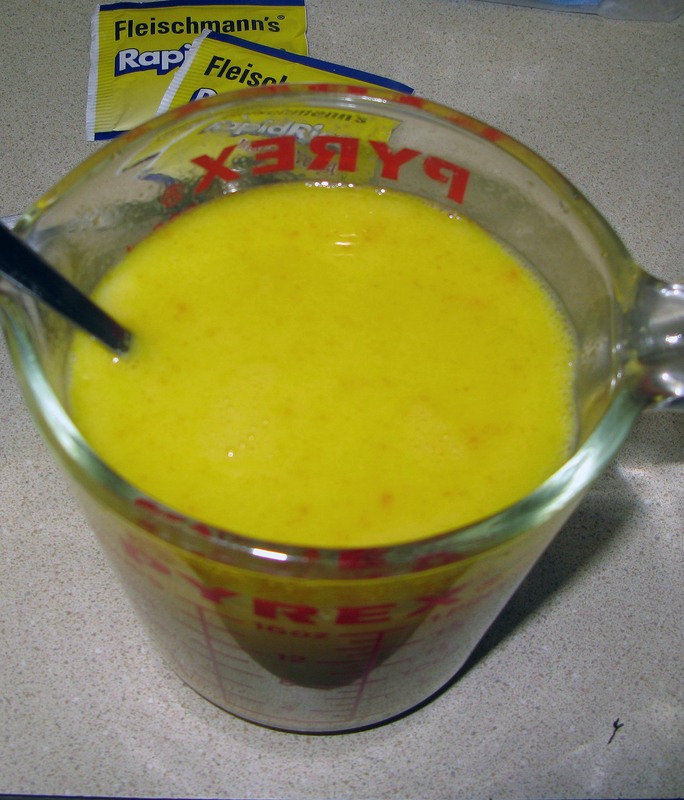 I heated the water in a Pyrex measuring cup in the microwave, then added the eggs and orange zest to the water and mixed it all with a fork. 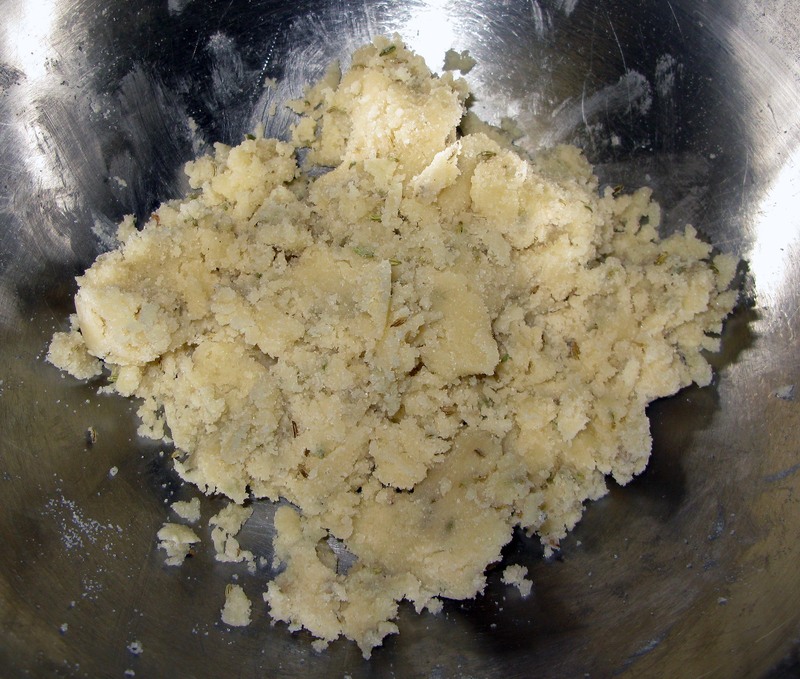 Add the egg mixture to the butter mixture along with an additional ½ cup of flour (we’re up to one out of six cups now). Mix until all of the lumps are broken up. Stir in the yeast and another ½ cup of flour. 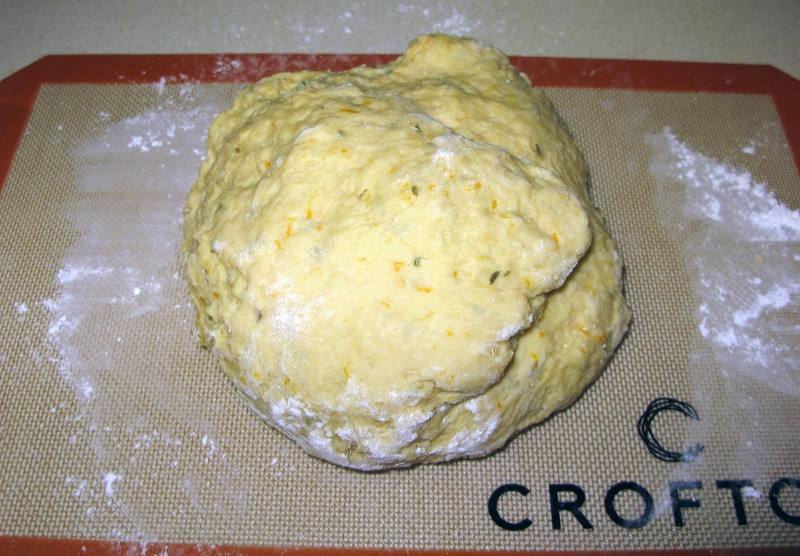 Stir in the remaining 4½ cups of flour, 1 cup at a time, until a soft dough forms. 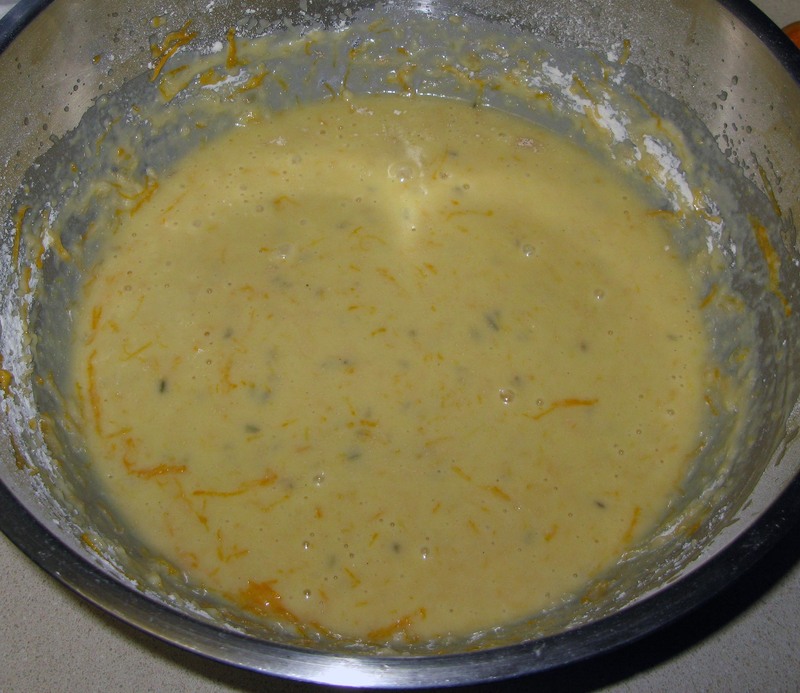 You may want to switch to mixing with your hands if you are having trouble using a spoon or electric mixer. 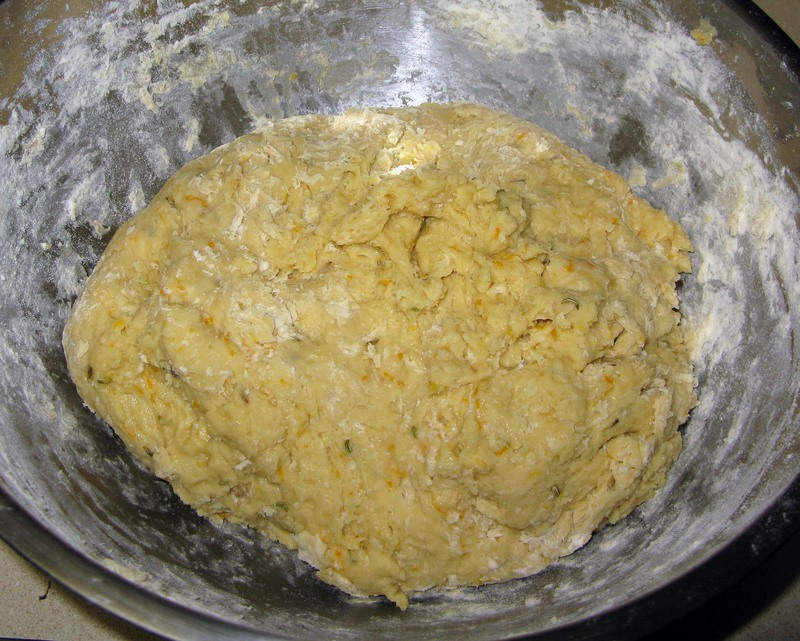 Knead the dough on a well-floured surface for about a minute. You should feel it become firmer and more elastic in that time. The directions didn’t say to do this, but I put the dough in a greased bowl, turning it once to coat both sides, to rise. It was cold in my apartment on baking day, so I turned my oven on to 200°F, then turned it off and put the bread inside to rise (covered with a damp towel, as directed) for an 1½ hours. 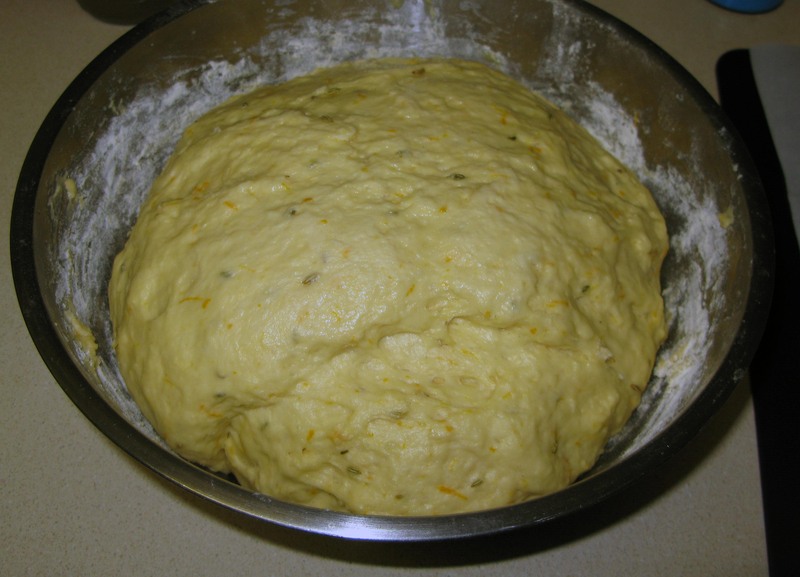 When the dough has become enormous, punch it down and separate off approximately ¼ of it (or separate it into however many portions you would like if you are making smaller loaves). Form the remaining dough into a semi-sphere (or a domed circle, if that’s more your speed) and transfer it to a parchment-lined baking sheet. This loaf would have been too big for my regular rimmed cookie sheets, so keep that in mind if you want to make a large loaf like this. 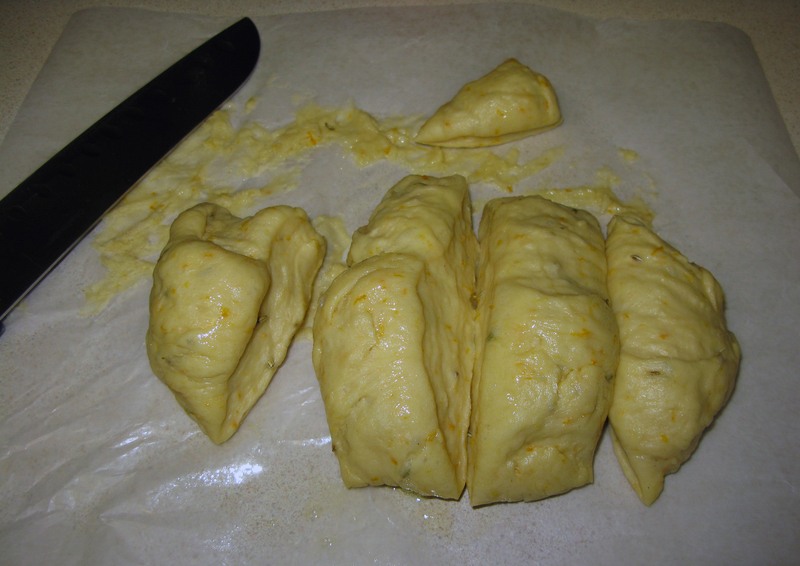 Divide the reserved dough portion into four pieces and one small piece (for the ball on top of the loaf). Form the dough pieces into shapes vaguely reminiscent of bones and drape them across the top of the loaf (as I mentioned earlier, I made eight smaller bones pieces and didn’t like how they turned out, so that’s why my pictures don’t quite reflect my instructions here). Bake the bread for about 40 minutes, or until it reaches an internal temperature of 200°F on an instant-read thermometer (I use one like this) and the top is well-browned. Apparently I forgot to take a picture of my bread when it came out of the oven, but you should be able to get the idea from this picture of the glazed loaf. Leave the bread to cool completely on a cooling rack. Once the syrup boils, remove it from the heat and brush it all over your bread. For a finishing touch, sprinkle granulated sugar all over the bread. Slice and serve in large wedges, and store leftovers in an airtight container.